Hollywood Beach Tower in Hollywood, FL was originally a college dormitory, built in the late 1960s and converted to a timeshare resort in 1981. 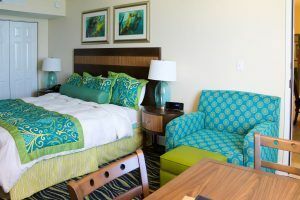 The rooms had not received a total renovation since the conversion in 1981, and the mirrored walls, pastel color scheme and old appliances needed a major update. In addition to being beautiful, these new units offer functionality that can generate more income for the resort and give owners more flexibility to rent, exchange, or use their units. The original units were separated into two rooms joined by a door. One room served as the master bedroom and the other as the living area with a small kitchen. The new units were designed by Hospitality Resources & Design with functionality in mind: the master bedroom includes a king sized bed, table and chairs, full bathroom, microwave, coffee pot, and small refrigerator. The adjoining room includes a dining area, living area, full kitchen with granite countertops, full bathroom, and a murphy bed stored in a cabinet along the wall. Both rooms were designed to be self-contained units allowing owners to have more options: use the entire unit with more comfortable accommodations for guests, use part of the unit and rent the other side out, or rent out both sides separately to maximize income. The entire project was completed in 2014.